The final issue of The Clone Conspiracy landed in our laps this week and it was actually pretty cool! The last issue was probably the best issue of the event. It had excitement, tension, team-ups, funny bits and a deep and abiding use of some of Spider-Man’s strongest relationships. 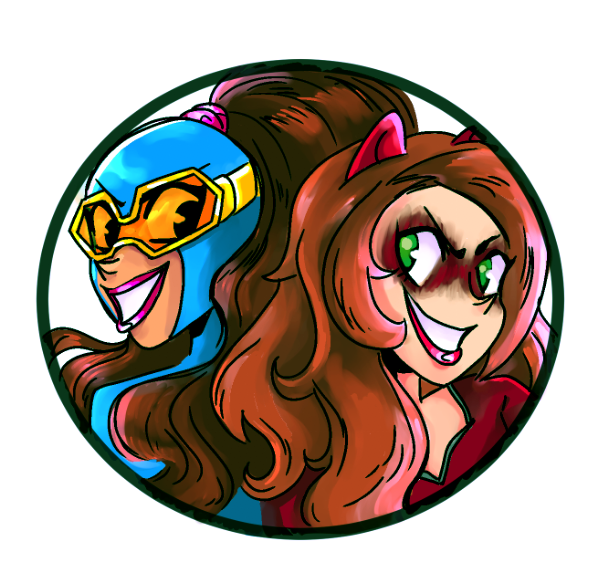 And best of all, my favorite characters are still alive! No spoilers here in the opening crawl. You’ll have to join me after the jump to see who I’m talking about. For now, I enjoyed The Clone Conspiracy for the most part, especially this final issue. But the problem with The Clone Conspiracy is that it was more idea than actual story, and even then, not a very clever or original idea. Basically, the Jackal comes back, clones a bunch more people, and when Spider-Man refuses to join him, he threatens to kill everybody. Spidey and his allies then flip a switch and the day is saved. The event was mostly characters explaining the idea to Spider-Man, with a few twists and sub-plots peppered into inflate the running time. Like I said, it was fine. Not writer Dan Slott’s best Spider-Man event, but I enjoyed it all the same. Now then, who gets to live? 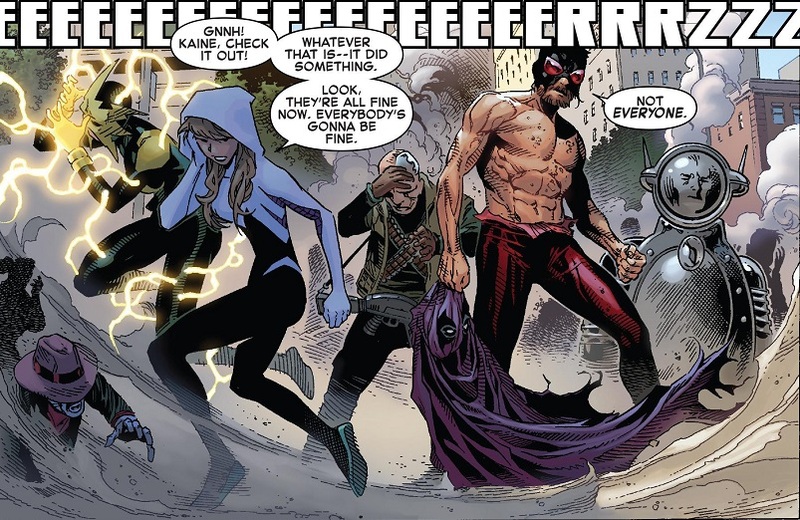 Both Prowler and Kaine get to live! Huzzah! The clone Prowler dies along with the rest of the clones. And it turns out that the original Hobie Brown wasn’t killed after all. He was just in medical stasis! He was in a pod this whole time! Does this mean the real Prowler is going to take over for the clone in the Prowler ongoing series? That’s insane! Marvel launched a Prowler comic to tie into The Clone Conspiracy, but it barely tied into The Clone Conspiracy, and now the main character is going to be killed off only a couple issues in? I’m thrilled, because I want to read a Prowler comic about the actual Prowler, not his pod person clone. But how silly is it to start a new comic series with a completely misguided swerve that eats up half a dozen issues and ultimately means nothing? Of course, the same thing happened with the Spider-Woman series, which launched with a crappy tie-in to Spider-Verse. Once it ditched its opening tie-in storyline, Spider-Woman became one of the best comics on the stands. I can only hope the same thing happens to Prowler! Kaine’s death was hinted at earlier in The Clone Conspiracy, but he ends the series on his feet and hopefully back to full health. So, like, did Jackal clone that robot in the background? Maybe he’ll die in some tie-in, but he seems pretty safe and solid to me! Of course, we were already told that Kaine would be a main character in Ben Reilly’s upcoming Scarlet Spider series, so I probably should have known. Still, I’ll take what happiness I can get in this day and age! 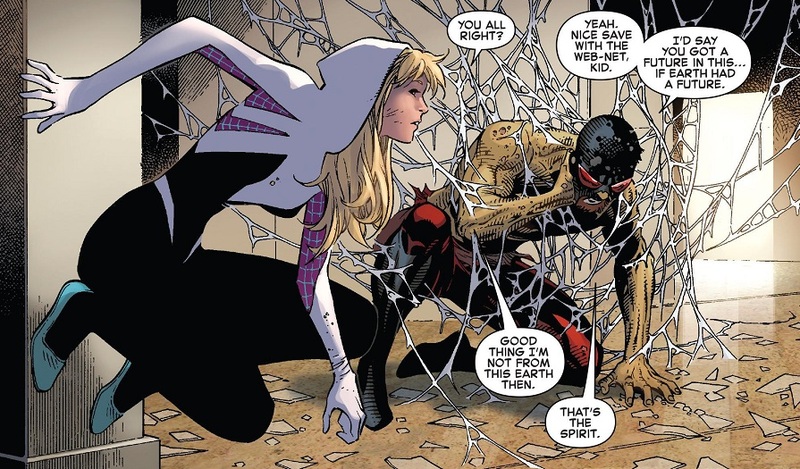 Also, anyone else starting to ‘ship Kaine and Spider-Gwen thanks to The Clone Conspiracy? Maybe it’s just me. Me and Dan Slott. Posted on February 16, 2017, in Comics, Marvel, Spider-Man and tagged Amazing Spider-Man, Kaine, Prowler, Scarlet Spider, The Clone Conspiracy. Bookmark the permalink. Leave a comment.